How much do you understand your fat? Fat cells is also known as adipocytes in medical term. It is the main culprit that made everyone panic and anxious about. Few billions dollar has been wasted each year just to eliminate all these stubborn fat cells. Body mass index is an index recommended by Centers for disease control and prevention (CDC) to determine if someone is underweight or overweight. White fats –> which is essential to provide us essential energy, heat and mechanical cushioning. And it is the main fat that contribute us our unwanted BULGES!!! Brown fats –> Found mostly at newborn babies which are used for thermogenesis (to produce heat). It will degrade slowly and get replace by white fats when the baby aged. Subcutaneous fats –> these fat cells located just underneath our skin. There are mouldable and pincable. They always give us the unwated bulges which we hated a lot! Viceral fats –> these fat cells located at our internal organs, e.g our heart and intestinal organs. It is hard to touch and not pincable. This kind of fat is dangerous and contributing to main cardiovascular events such as heart attack and stroke! Fat cells will never multiple like other cells such as skin or hair cells etc. The fat cells in our body will remain constant once we reach puberty. For instance, if you have 1 million of fat cells by the age of 18, you will still have 1 million of fat cells by the age of 99. That is the reason why obese child will gain weight more easily as compare to their peer when they are reaching 30’s or 40’s as their fat cell number is comparatively more than their peer. 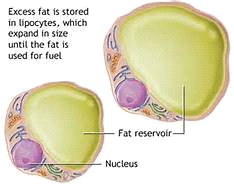 Fat cells basically is the main reservoir to store our extra energy so that we can use it when we are in need. Hence, when we are in inactive state and overeat, the excess energy will be converted into tiny fat droplets to be store in the fat cell. The fat cell will be like a balloon and gradually increasing it’s size. When 1million of fat cells increasing in their size, that is the time you will start noticing your bulges. 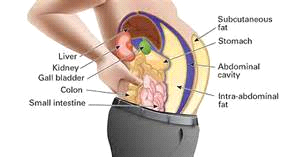 In another way, when we in active state and starving, the energy will be withdraw from the fat cells and your “balloon” will start strinking and that is the time we start loosing our bulges and started to get our figure. There are 2 main way to slim down. This can be done by the easiest way, that is by exercising and dieting. However, in medical way, there are different kind of medications or supplements that can be use to reduce our appetite, increase metabolic rate, and to prevent carbohydrates and lipids absorption. All these medication will accelerate energy withdrawing from the fat cells and subsequently reduce the fat cell volume. Hence, as time goes, our body size will reduce and shrink too! However, the cons will be, rebounce! As mentioned earlier, the fat cells are not eliminated and are readily to store the excess energy when we got back to our old lifestyle. 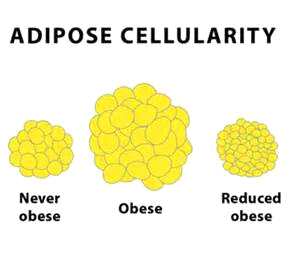 Killing of fat cells will reduce the fat cell numbers and subsequently reduce the size at the treatment area. The fat cell numbers are reduced at treated area as compare to non treated area, hence, rebounce is very minimal unless patient overeat and causes the remaing fat cells to bloated like a huge balloon! As a conclusion, there are many ways to slim down. One must understand which is the most effective and afforadale way to slim down. As a consumer, we should study each of the method or medication well before applying on ourself. Slimming not only give us the confidence in life, but it also helps in preventing different kind of diseases due to overweight. However, we should be moderate and choose the best way as excessive weight loss in another way, might harm our health too. Hence, happy slimming everyone!